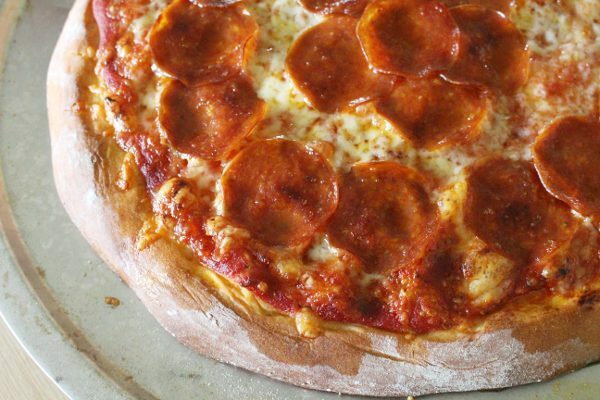 A quick and easy homemade pizza dough made without yeast that needs only 3 ingredients! Combine all ingredients in an electric mixer bowl. Using a dough hook, mix the dough until smooth and shiny. Separate dough into 2 parts, rolling one at a time on a floured surface. Transfer to a lined pizza pan (we use parchment paper). Repeat with other half of dough. Dress the dough with whatever toppings you enjoy. Bake at 425 for 15-17 minutes or until a bit darker than "golden brown". You can roll the pizza dough on the pizza baking pan with the liner already in place to avoid dusting your counter with flour! How to freeze homemade pizza.